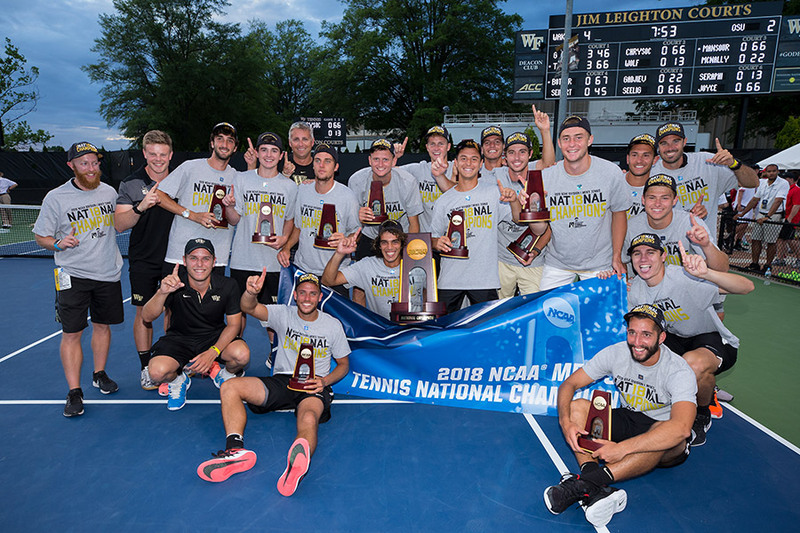 A year ago, in May 2017, after Wake Forest’s men’s tennis team lost too early in the NCAA tournament, I concocted a plan. 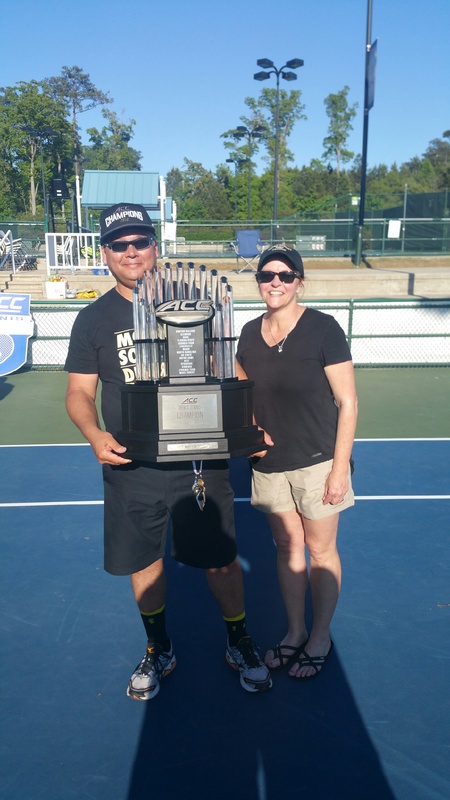 The plan was to string for the team for a 10th and final year, win a National Championship on our home courts at the Wake Forest Tennis Complex, and go out on top. 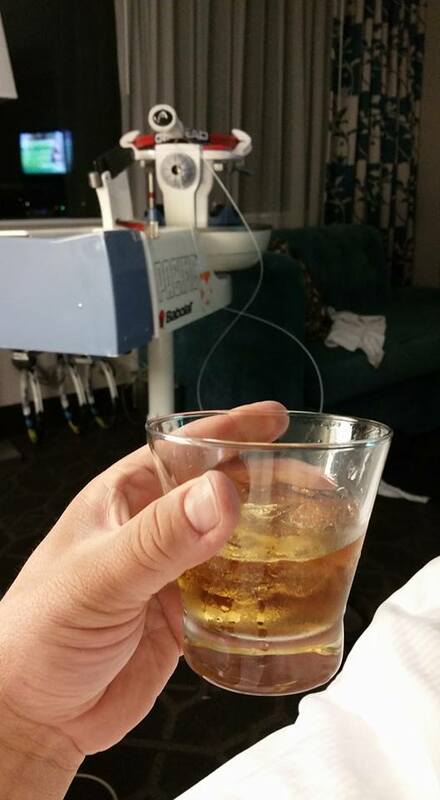 I only told my wife, Sandy, and a couple of friends of my plan. When Wake Forest won the team title, the reality of my impending retirement set in. 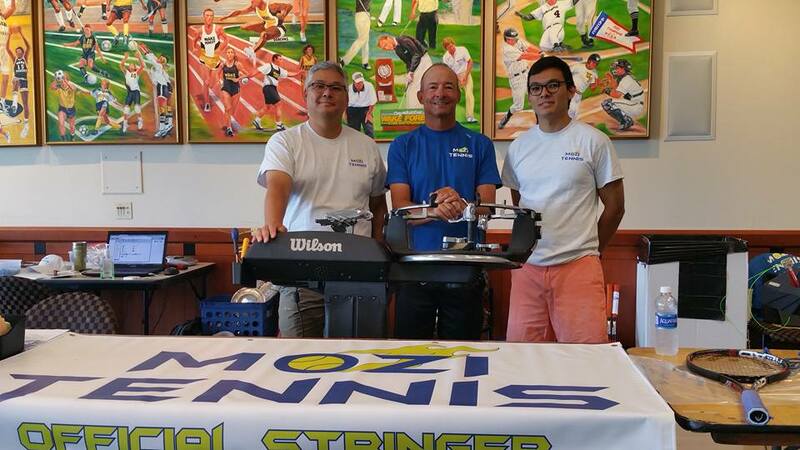 My son, Paul, who has been deeply involved with the stringing business from the start, actually strung most of the Wake Forest rackets during the tournament (as he had during the season). 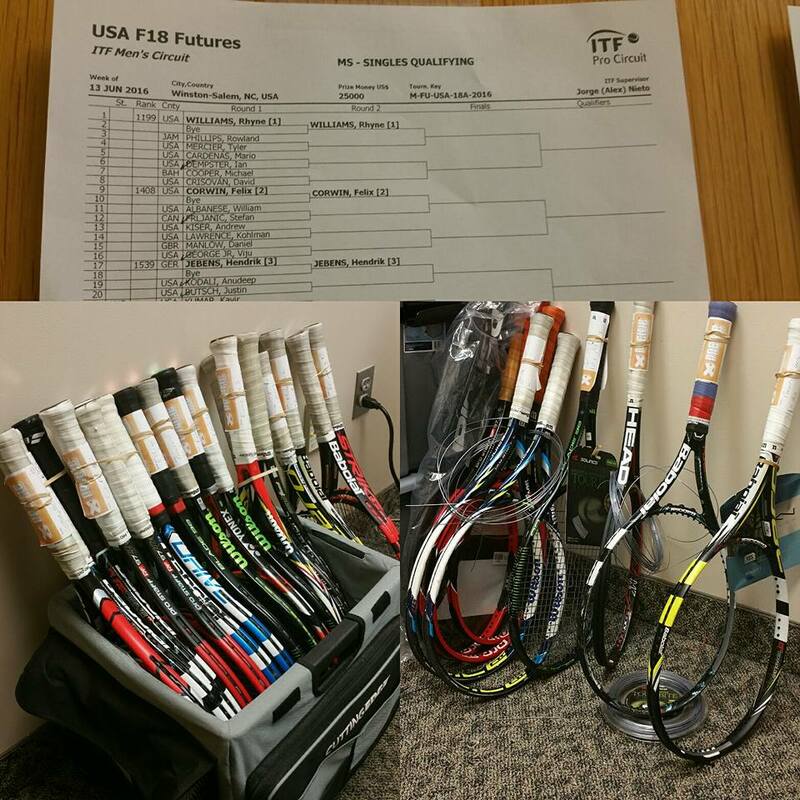 But I wanted to make sure the last rackets I strung for the team were memorable. Petros Chrysochos and Borna Gojo gave me the perfect memory when they made the Men’s Singles final. 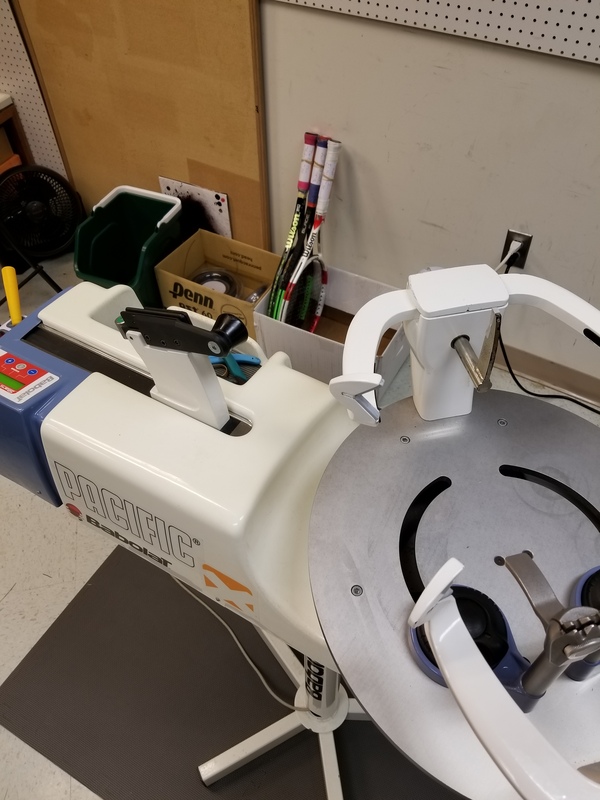 The last four rackets I strung as the head stringer for Wake Forest Men’s Tennis were two for finalist Gojo and two for NCAA Men’s Singles Champion Chrysochos. Delivering Gojo and Chrysochos their rackets for the NCAA Singles final, my last four rackets as head stringer for Wake Forest Men’s Tennis. I couldn’t have scripted my exit any better. 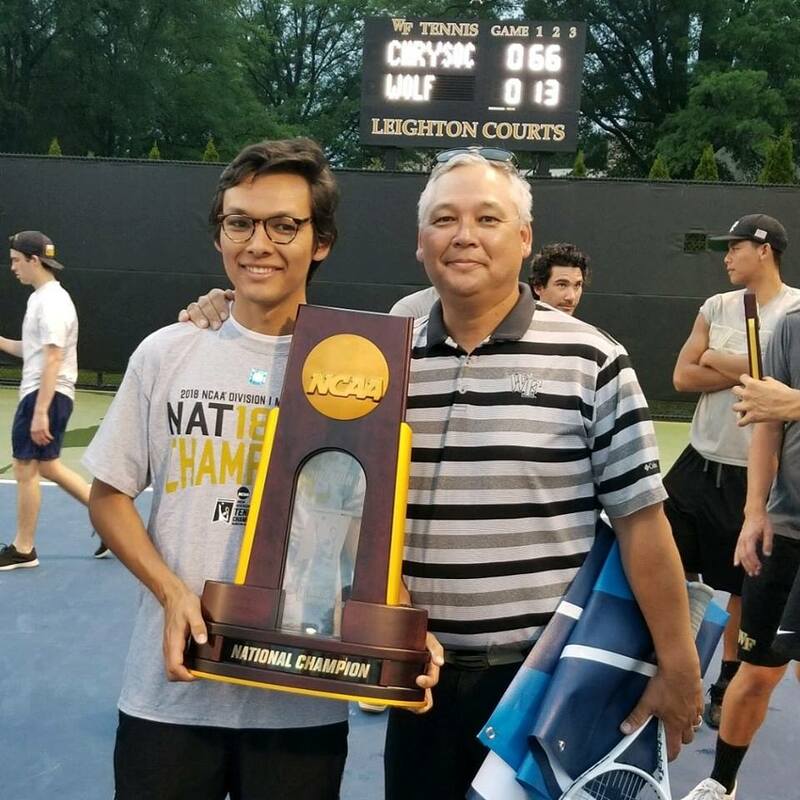 10 years and several thousand rackets leading up to the NCAA National Championship as a team, capped off with my very last racket: Petros Chrysochos’s racket #13, the racket he used to win the NCAA singles title. Last racket on the machine: Petros Chrysochos’s championship-winning #13. 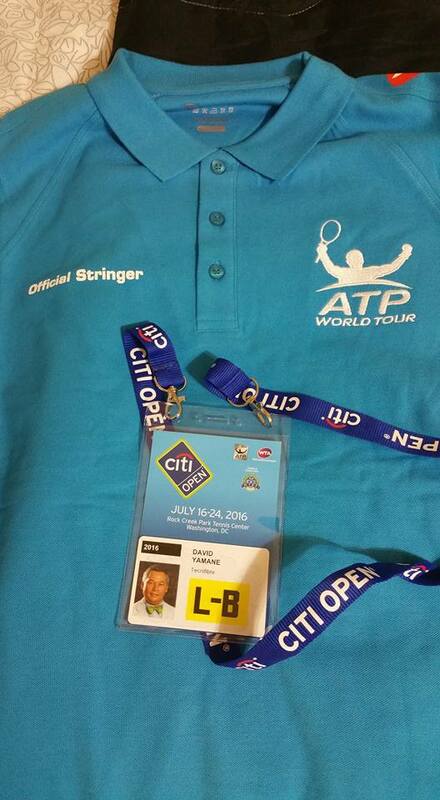 I’m happy to be able to leave the responsibility of head stringer to Paul. The team is in good hands. 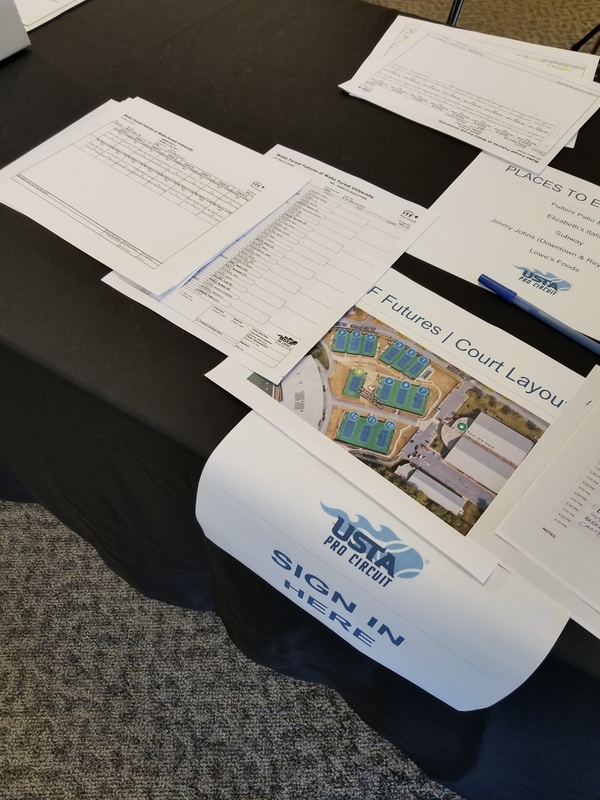 And I will be around to customize and consult, and to cheer for whoever is playing Court 6 for the Deacs, as long as I have my day job. 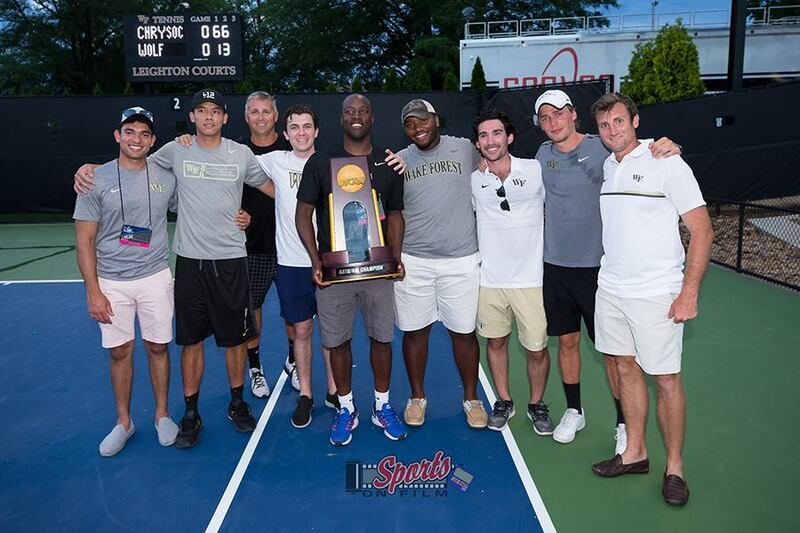 10 years ago, All-American tennis player Cory Parr (WFU ’09) facilitated Big Time Tennis becoming the official stringers for Wake Forest University’s men’s tennis team. 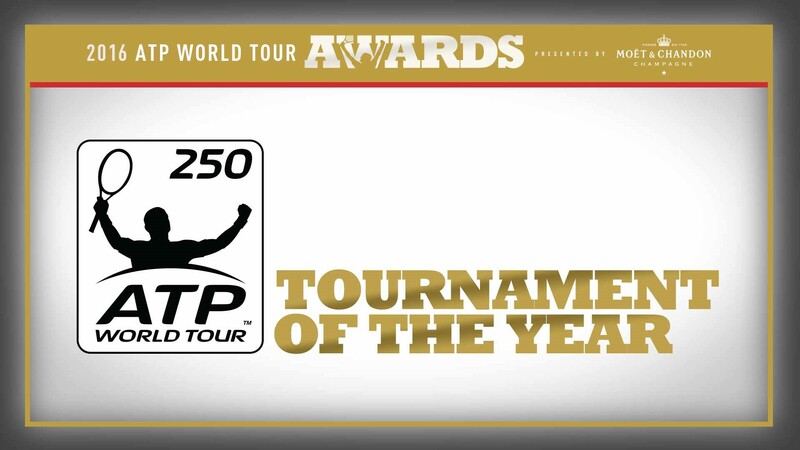 Except when they were on the road, my son Paul, my wife Sandy, and I have strung every racket for the team since then. Through Tuesday, May 22, 2018, the racket total was 8,555. No one associated with the day-to-day operations of the tennis team has been with the program longer than Paul, Sandy, and I. 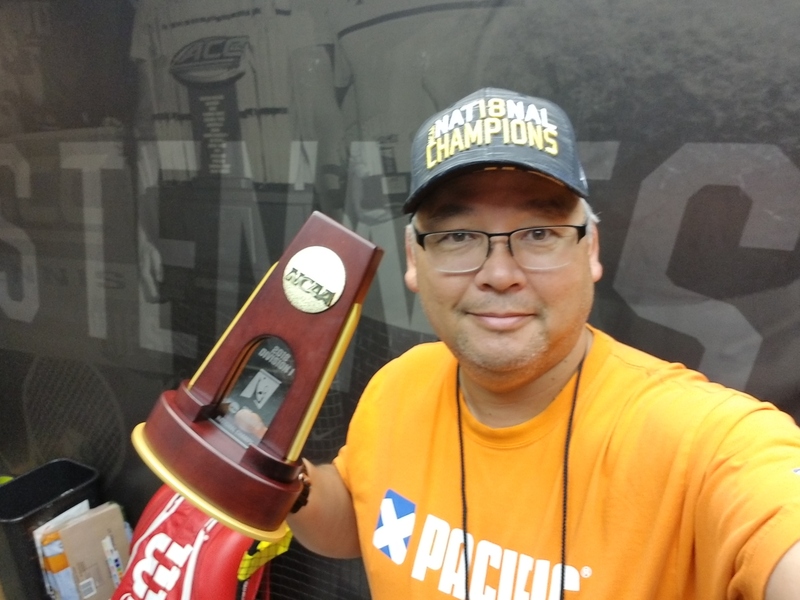 So, we were as proud as anyone to be able to hold the NCAA Division 1 National Championship trophy last Tuesday night. Of course, we were just one part of a complex operation that makes winning championships possible – coaches, trainers, strength and conditioning coaches, SIDs, and others. But most importantly, the players. This team is composed of such a diverse set of personalities, I often refer to it as the team from the “Island of Misfit Toys.” A Croatian Oak, a Magician, a Dancer, a Veteran, a German Engineered Man of Steel, and others. An amazing part of the experience was seeing how many Wake Forest University tennis alumni returned for the final. Many of them got on planes Tuesday morning to be at the match. Every player — those who attended and the many who could not — played a part in the building of the program to its current status. 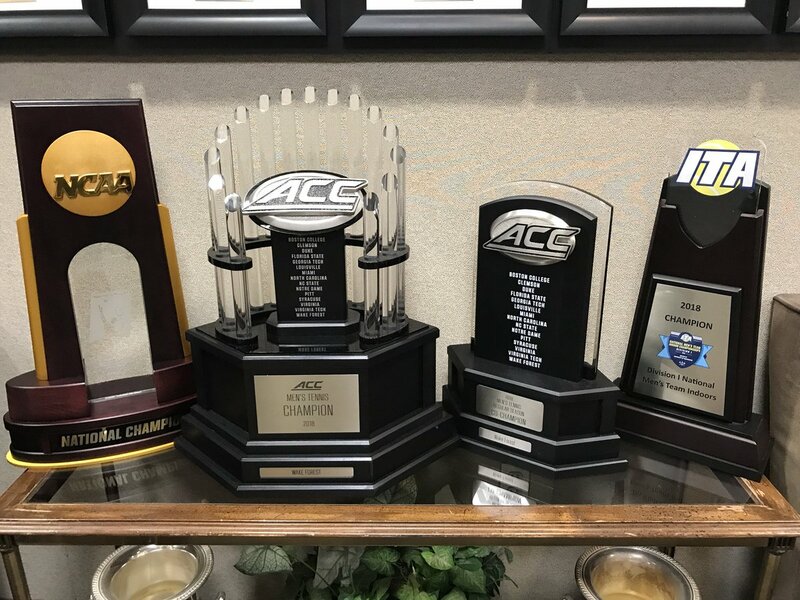 As an observer of the team, I have been impressed at how they handled being ranked #1 in the country the entire year, and winning every major title possible: ITA National Indoors, ACC regular season, ACC tournament, and NCAAs. Wake Forest’s tennis program has not always been well-funded. In our 7th year stringing for the team we were paid the same as in our 1st year; our first raise was in our 8th year. The feeling that something special was happening with the program made it easier to stay on despite being more underpaid with every passing year. During the lean years and continuing through this championship, Pacific has been a consistent sponsor of the Demon Deacons on court. The “X” you see on the rackets is a visual representation of that support.